Most of the websites that you will come across, will always be found to commit the same mistake, of embedding text, wherever there are images. This can be verified very easily by simply looking at any instances or occurrences or presence of text on top of any image displayed on a Web page. Now use your mouse, to point over the textual content, present on top of an image, and try selecting this textual content by using your mouse pointer. If you can select this textual content successfully by using your mouse, then it is plain textual content. However, if you are unable to do so, then you are looking at an instance of embedded textual content. The drawback of embedding significant textual content as part of an image is that it is not accessible to search engines to consider such embedded textual content for presenting in search results. This is because such embedded content is simply inaccessible to search engines. To add to this issue, if you do not have references to the same piece of potential keyword rich content as part of the other textual content on that Web page, then your web page loses out on the desired visibility. The same is the issue faced in case of navigation buttons or navigation arrows, which are usually images. If there is no textual navigation, the search directories will fail to proceed to further web pages of your web site. They will simply freeze at the first page that is devoid of textual navigation. The solution to this is to have an arrow icon with plain textual content such as “Previous” or “Next”, instead of just a forward or backward pointed arrow. Similarly, you can have a house icon with plain textual content such as “home”, in place of just the house icon, if you want to depict the home page. Another disadvantage of using embedded textual content in images is that such textual content, is not accessible to visually challenged computer users. For instance, if a visually challenged computer user uses text-to-speech software to hear the application read out textual content from the web page, the application will not detect textual content that is part of an image, and as such this embedded textual content will not reach a visually challenged user. Similarly, the Braille software also works on the basis of textual content detected. On the other hand textual content that is undetected will remain unavailable through the Braille software to the visually challenged user. Imagine having the name of your business or even your contact details superimposed on an image, and as a part of it, in embedded form. Can you fathom having a web page that you created to advertise your business name and instant contact details, but failed to let the search directories even know what your business name is, or how and where to contact you? Sounds crazy, but that’s exactly what a lot of websites do in ignorance. If at all you have already committed such a mistake, you can make up for it, by having your business name, contact details or any other critical information, incorporated as part of the plain textual content of your web site. 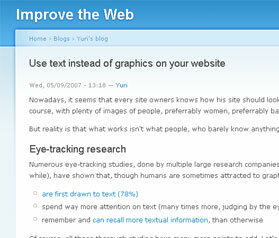 Thus you can see the significance of textual content in place of images in websites.